By appearance, name, and, for that matter, any conceivable aspect other than actual recorded music, one would peg Seymour Glass as a cookie-cutter emo band. One would expect its debut Note to Self to feature the same type of unoriginal and downright boring tunes, filled with acoustic guitar-derived melodies and whining vocals, as any of the countless other acts to which the recent explosion of the sub-genre has given birth. That assumption, however, would be very wrong. 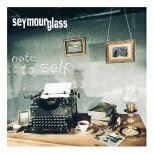 For starters, Seymour Glass — which takes its name from a character created by author J.D. Salinger — is willing to take risks by employing song structures that are far from predictable, and lead singer Artie Kitchen successfully avoids the annoying qualities that plague his peers’ less-than-soothing endeavors. In addition, Steve Pepe crafts guitar accompaniments that are catchy without feeling trite, and the incorporation of acoustic piano into several of the arrangements resurrects an art that has been lost in the current age of all-too-generic pop-rock. With songs that vary in tone from somber (Everytime) to innovative (Broken) to just plain rockin’ (Hypervent), Seymour Glass breaks through the songwriting drought that for far too long has been plaguing the rest of the industry. With a pop-infused sheen that envelops a rock ’n‘ roll heart and an imaginative brain, Note to Self transcends its light-rock pretensions, putting collectives like Dashboard Confessional and the rest of the laughable emo scene in their place.